Famous for great value, Australian wine is so much more. 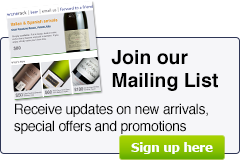 Winerack has a select range of refined and sophisticated wines from boutique wineries. This wine has the same complexity and length as a $200 plus bottle of wine. Typical regional characters of liquorice, raspberry and five spice are matched with restrained toasty oak. The palate is rich in red fruits, cocoa-like fine powdery tannins and long lasting fruit flavours . Howard Park 'Miamup' Margaret River Cabernet, is a well made medium-bodied wine, spending 18 months in French barriques. Black cherry colour with floral notes of violets & fruity, aromas of blackberry muffins. The palate is soft, inviting, and full of free range forest fruits, vanilla, cocoa with supple fine tannins. The Howard Park Leston Shiraz is a single vineyard wine from the Leston vineyard in Margaret River. It is an exotic mix of ripe fruit flavours, hints of pepper, ginger spice and chewy tannins married with delicious underlying spice and oak intergration. Leston Cabernet offers accents of black currants, purple florals, choc-mint and toasted cedar waft out of the glass, whilst the palate is elegant and juicy fruity, with a fine but solid line of tannins, bright acidity, and a kick of spice on the long finish. In the mouth the wine is dry and muscular with firm bitterness, lively acidity and solid, round structure. Rich complex fruit flavours with a strong note of spices. Tannins are perfectly integrated, balanced and silky. The finish is very long and lingering with blueberries and white pepper. The 2013 vintage shows in dark ruby red with purple hues and a translucent edge. The bouquet is dense in dark berry fruits with hints of sweet, talcy and spicey French oak.This wine has a powerful presence, a sweet core and lasting flavours that with reveal and reward with time.